Peta Stavelli gets behind the wheel of the Grand Panorama and finds herself unexpectedly keen to become accustomed to the luxury this larger-than-life offering affords. When it comes to recording first impressions of Bürstner's biggest New Zealand offering to date — the newly-imported, nine-metre Grand Panorama — three letters will suffice: WOW. This is bigger than Ben Hur, and I had some initial trepidation about getting behind the wheel. It's a lot of vehicle to manage and as we pulled out onto the busy main road through Albany Village, I half expected to hear the scrape of the low stone wall along the passenger side of the vehicle. 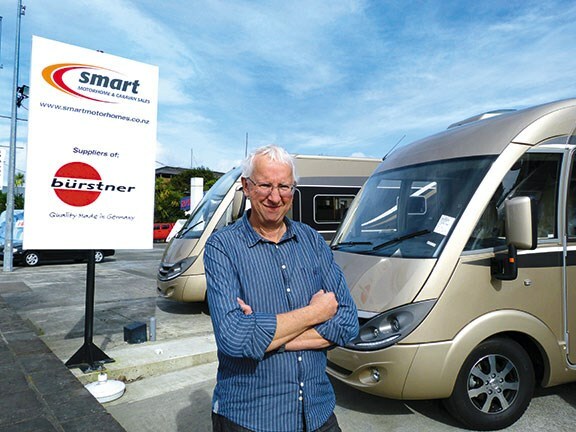 Instead, Smart Motorhomes' outgoing director Terry Tuohy turned briskly into the traffic flow and we pulled away with no sickening crunch to accompany our passage. Up the steep incline we swiftly drove. 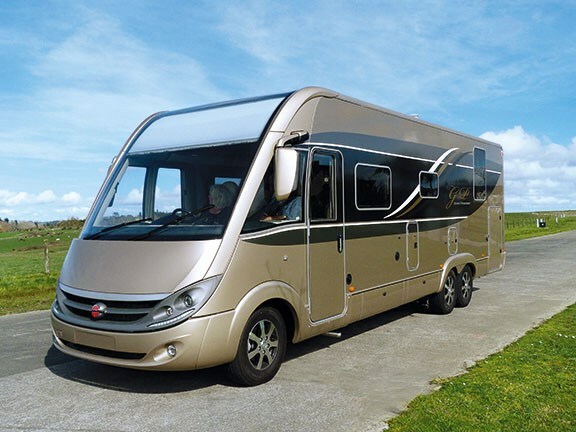 At 80kph on a long slope, there was still a great more punch to pull from the feisty Fiat Ducato engine. From a passenger's perspective, the Grand Panorama appeared to drive like the family Pajero. I was now keen to get behind the wheel but waited until we were high up on the hills in a new subdivision with wide, empty roads. Up there, there was still a pesky pile of landscaping stones to avoid, so with an empty road in front of me, I elected to take the right-hand lane to give them a wide berth. I need not have exercised any such caution. This vehicle turns on a dime. The spec sheet gives the official turning circle as 17.4m. That's quite an achievement for a vehicle of this length. But back to first impressions, which in this case are lasting. 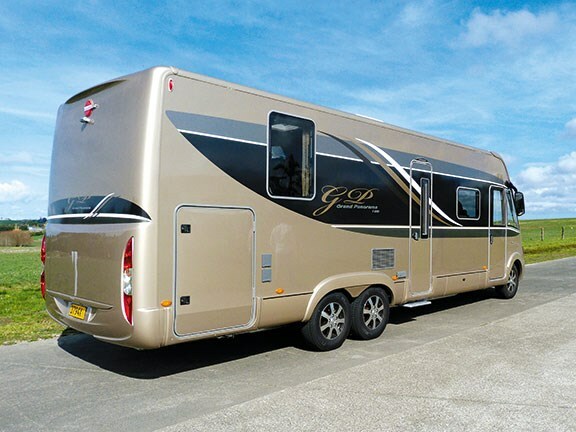 This is a luxurious apartment on wheels, with all the bells and whistles a discerning buyer would expect from a premium-class vehicle. The vehicle we drove featured rich cream leather upholstery offset by warm wood and high gloss, easy-clean surfaces in a harmonious blend of colours. Together with gleaming stainless steel fittings, plenty of glass, and tasteful lighting, this adds up to an elegant interior. Adding to this impression are the deep wine lockers, where up to six bottles can safely be carried and displayed along with matching glassware. 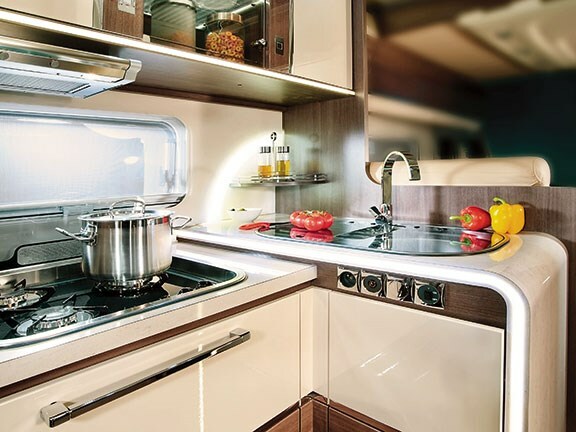 The galley is both beautiful and practical, with appropriately-sized appliances and plenty of room for preparation and generous storage. This generosity of space does not initially appear to carry over to the bathroom. However, this is where Bürstner's legendary design abilities come into play. In some models, the entire washbasin area swivels to one side to create a generous space for showering. 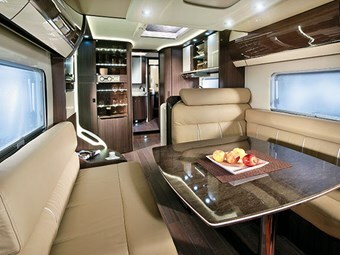 Additionally, the area features good fittings, lighting, and plenty of storage. If there is one sour note, it is the central handbasin located on the snub wall of the island bedroom. Though an attractive oval shape, and no doubt sufficiently robust in design, it appears flimsy and not in keeping with the other quality fitments throughout. However, the instant and pervading sensation throughout the vehicle is one of high-end design and luxurious appointment — aptly described in Bürstner brochures as 'seductive'. 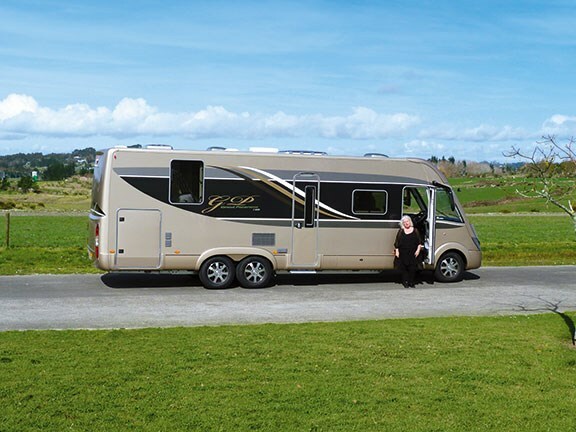 Certainly I was seduced by it, but not more so than by two extraordinary features: the drop-down bed, which glides smoothly down to rest lightly upon the backrests of the leather settees, and the front window blind. Sheer brilliance on both counts. My initial reluctance to get behind the wheel was essentially overcome so that I could get a true picture of the vehicle's merits, mostly from the point of view of manoeuvrability. However, it is only in this position that it's most-important and namesake amenity is revealed: the Grand Panorama. While the accompanying images will do more to describe this than I can hope to convey in words, let me tell you, the sense of light and space is unsurpassed. As a teenager, I rode motorcycles. Happily, I survived the more reckless aspects of the experience. Safety aside, I have since unfavourably compared the experience of driving a motorcycle with that afforded by driving a car. My conclusion remains this: riding a motorcycle puts one firmly into the view while one can only look at a view while driving a car. I cannot claim that I similarly enjoyed the smell of freshly mown grass, or the subtle perfumes of spring flowers wafted on a gentle breeze while driving the Grand Panorama. But I certainly enjoyed the vastness of the view as at no other time while behind the wheel of a vehicle. And I was absolutely captivated by the cleverness of the windscreen blind, which dropped to the required level to block out blaring sun while driving, or prying eyes when stationary. And when the overhead (and hitherto completely hidden) second bed was quietly and smoothly deployed by remote control, I was hooked. How could I not be, when the gorgeous, comfortable double bed materialised from where it had been sneakily masquerading as a ceiling panel? And bear in mind, this may be the second bed, but I could easily be persuaded to forgo the hidden charms of the generous master bedroom for the panoramic views afforded by this one. And — as with all beds in Bürstner's vehicles — the combined slatted bases and cold-moulded mattresses make for superior sleeping comfort, as I can attest from previous experience. On this occasion, I did not sleep in the test vehicle. Goodness only knows I would have loved the opportunity to enjoy for an extended period in the sort of luxury I can normally only dream of. Sigh! If fortune has favoured you and you now find yourself in the market for a luxury vehicle, do take a Grand Panorama for a test drive.